I was so excited yesterday after finding a dress form for sale on the local Craig's List. Yahoo! I did not have to order online and wait 4 to 6 weeks. I drove 20 min. to Lake Forest and picked it up. So, I've been photographing some of my scarves on the form since I don't have a live model. When I last posted, I totally forgot that the week before, I had knit another Morning Surf Scarf. Yes, my fourth one. I'm addicted to the way the colors of my handspun shake out in the knitting. An excellent project for handspun -- do you hear me, Jerry of the size 15's? Here are the rovings from which the yarn was spun. One ply was my "Wine Country" colorway and the other ply was "Wine Country Marl". The fibers are oh, so, yummy -- merino wool, cashmere and angora. It doesn't get much better than that. And here is another scarf pattern that I highly recommend. It just knits up beautifully -- the Buttonhole Scarf that was featured in the Fall 2008 issue of Vogue Knitting, project #37. Being a weaver, I was drawn to this pattern, because it almost looks handwoven, like a basket weave. I used some handpainted merino wool yarn that I purchased from Plain & Fancy Sheep & Wool Co. of Henderson, TX, when I attended the Taos Wool Festival. Unfortunately, they don't have a website. Their booth was packed, though. Great color sense. And, finally, yesterday, I started a second Starry Nite Scarf, one of Lynne Vogel's Etsy patterns. 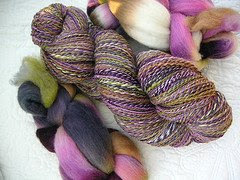 (www.LynneVogel.Etsy.com) The yarns I am using are, of course, my handspun yarns and mostly merino wool and cashmere. 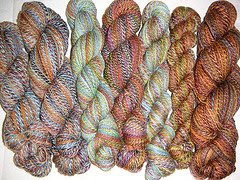 I spun these yarns from a grouping of 5 rovings handpainted by Lynne herself, in colors of the Southwest, including Santa Fe, Albuquerque, Abiquiu, Faux Autumn Leaves and Taos. I plied the colorways in different ways and ended up with some lovely skeins. I'm also including some other yarns from my handspun stash. Close up. These little four corned stars, with the swirl in the middle, just make your handspun colors come alive. Here are my beautiful skeins. This year, I have not gotten into the Christmas shopping frenzy -- guess that is why I have been in a knitting and spinning frenzy -- avoidance of mall situations. Come to think of it, I never get into a frenzy over it, but I have been very lax this year. I think it's the economy, among other things. When your wants and needs are primarily fulfilled, it's hard to just go out and buy stuff for the sake of buying, especially when there are so many people who are losing their jobs. And our family decided to go low key this year, but . . . alas, my husband and I decided we needed to do a small bit of shopping today. The bad part is that this is going to cut into my fibery endeavors. Drat! hoorah for square addiction!!! goergeous colors, if I do say so myself. All of those scarves are gorgeous (I can just imagine the "star" scarf)! You have a knack for picking patterns for handspun. Hope you survived the mall :) Eek!